A new and much needed addition to our GPU review is tracking power consumption. Here, we're using a simple meter to track the power consumption at the power supply level, so what we're left with is total system power consumption. But with the rest of the components in the test system remaining the same and the only variable being the video card, we're able to get a reasonably accurate estimate of peak power usage here. Then, we fired up Doom 3 and ran it at 800x600 (High Quality) in order to get a peak power reading for the system. Interestingly enough, other than the integrated graphics solution, the 6200 is the lowest power card here - drawing even less power than the X300, but that is to be expected given that the X300 runs at a 25MHz higher clock speed. It's also interesting to note that there's no difference in power consumption between the 128-bit and 64-bit X300 cards. The performance comparison is a completely different story, however. 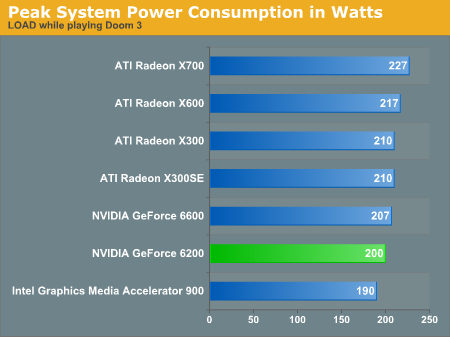 In the end, none of these cards eat up too much power, with the X700 clearly leading the pack at 10% greater system power consumption than the 6600. 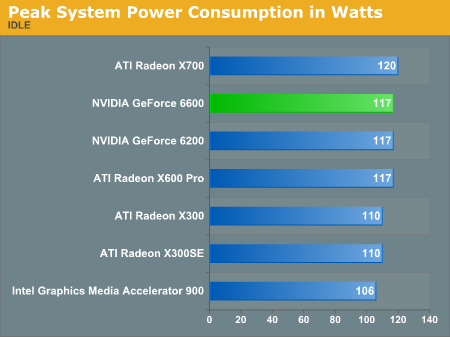 It will be interesting to find out if there's any correlation here between power consumption and performance. Doesnt 2 cards cost more then one? And whats the difference between having two 6600GT vs 6800GT? in price and performance? I'm sure the core of the 6600 will overclock very well, but the memory all depends on the particular chips used and might not have any real headroom. That could be its main problem as its an 8-pipe 300MHz core so theres plenty of power there, but only 128-bit 500MHz (effective) memory which is what is probably holding it back. If thats the case then overclocking the core may not help very much.
" I can't see how the 6200 could have a street-price of $149 (128-bit) and $129 (64-bit). " It's actually $129 for the 128MB 128-bit version and $149 for the 256MB 128-bit version. The 64-bit version (only 128MB) should have an MSRP of $100, according to the Inquirer. In my opinion ATI beats all nVidia cards except for their $200, where the 6600GT wins. But we can't forget the 6600 has a great overclocking potential, and street prices should be lower than the X700's, because of the slower memory. Like already mentioned, you can find the 6600 for $135 already.